If you are into high-quality SUVs, then you are probably familiar with the Jeep Grand Cherokee. For years it has been one of the leading SUV options because of its capabilities and style. For 2018, Jeep made several changes to the Grand Cherokee trim packages so that you can get a Grand Cherokee that is exactly what you’ve been looking for. 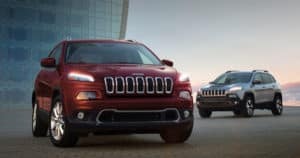 If you want an SUV with enough customizable options to be exactly what you want, here is your guide to the 2018 Jeep Cherokee trims. The introductory package for the Jeep Grand Cherokee is the Laredo. It offers all of the standard features for the Cherokee including performance features that make it a strong off-road performer. The Laredo is the package that you want if you are looking for the best value at the most affordable price. Near the top of the standard trim packages is the Sterling Edition, which improves the Cherokee’s look with new aesthetic features, paint jobs, and interior design changes. New platinum chrome accents and 20-inch Heritage wheels make a big difference in the Cherokee’s overall appearance. You also get other internal features like an 8.4-inch touch screen to go with the Uconnect 4C Nav system. This is one of the best choices out of the standard packages before getting into more specialized options. The Grand Cherokee Summit is one of the most luxurious vehicles in its class, and one of the most luxury-focused trim packages for the Grand Cherokee. It has nearly all of the premium features that are available for the Cherokee including a Harman Kardon 19-speaker audio system. You also get an exclusive exterior color and design, which will help it stand apart from the other options. If you want luxury, then this is the best package to choose. The Trackhawk is the highest trim package available for the Grand Cherokee, and it follows the same path as the Dodge Demon and Hellcat. It is designed to get the most powerful performance possible. With 6.5L HEMI V8 engine, the Trackhawk puts out over 700 hp and 645 pound-feet of torque. Thanks to Jeep’s improved traction control systems, you can put all of that power to good use on and off of the road for an exciting higher performance drive wherever you go. This is the package that you want if you are into extreme performance. There are many other trim packages for the Grand Cherokee for you to check out, which offers you a lot of versatility in your options. The best way to find out which one is right for you is to work with the Jeep experts at Westgate Chrysler Jeep Dodge. They can show you the different features, as well as take you on test drives so that you can see exactly which one fits your needs the best. In the end, you’ll get a Jeep Grand Cherokee that will make driving easier and more exciting for you, which is just in time for your big summer vacation plans.